Robots and Rivers: Clearpath’s automated Kingfisher heralds a new era for monitoring. One of the major challenges we face today is developing a good understanding of the current condition of our water resources. For decades, we’ve used a variety of methodologies to gather crucial information, many of which require labour-intensive tasks, and some of which are risky. Still, there are information gaps. 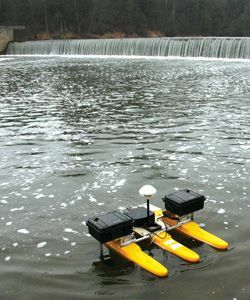 When a University of Waterloo professor of hydrology saw the opportunity for automation in water data collection, he enlisted Clearpath Robotics, a local company specializing in the design and manufacture of unmanned vehicle solutions, mainly for industrial research and development purposes. The result is the Kingfisher M100, an unmanned surface vessel designed for environmental and civil engineers. The robot can reach areas that researchers might not be able to survey in a traditional “tinny,” either due to safety concerns or inaccessibility. Users can plan their surveys (the product can be customized to sample for myriad parameters) in advance or on-site. The program is user-friendly: it’s powered by GPS and an interface developed with Google Maps. Once the parameters are set, users can launch the Kingfisher, hit the start button, allow the robot to do its work, and analyze the samples for results. Remote control is also an option, which allows users further customization. A fast, agile, accurate robot that may also reduce survey costs by almost 50 per cent, freeing up budget to allow researchers to further develop analysis? To early adopters, it seems like a no-brainer. In less than two years, Clearpath has secured accounts with over a dozen of North America’s top technical institutions, and the Massachusetts Institute of Technology, University of Waterloo, the University of Calgary, York University, and the University of Ottawa are using the M100 specifically to accelerate their surface-water research programs.